April | 2016 | PlugInCaroo… Karo plugin… abhi!… save the environment!!! Now that the Mahindra E2O has gone to UK… its time to review the car against its younger brothers… the Twizy, Zoe and Leaf. Younger brothers because the Mahindra E2O is Version 2.0 of the Chetan Maini’s Reva Car called G-Wiz in UK. The first generation of G-Wiz was an awesome car back then… and offered something no car maker ever dared 20yrs ago!!! To make an electric car… and then export it to 23 countries. It was an era when Tesla as a company was not even born. A car so light which could be pushed by a 5th grade student. The Lead Acid battery in the 1st generation car could last as long as 5 YEARS!!! The lead Acid battery longevity is unparalleled even today !!! The Version 1 of E2O called Reva Car had also traveled 3,500 kms cross country through 15 Cities in India in the year 2009. In the process to find an investor/car maker Chetan lost 10 precious years… 5yrs in his chase to find a car maker who could maker bigger investment and take it forward… and another 5yrs to get the car manufactured and released. This was the time when the Indian economy was opening up and there was threat that the US car makers would come and capture the entire market. This never happened… just like iPhone US cars could never become a favorite of Indians. 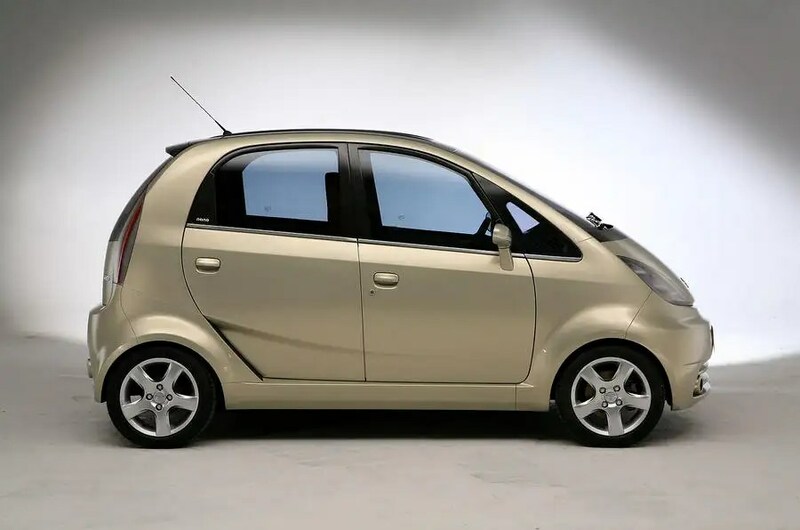 But after loosing 10 precious years the version 2 is out and we would stick our neck out and say Reva2 (E2O) is almost…almost on par with the Best Electric Car in the business… The Nissan LEAF. This entry was posted in Uncategorized and tagged 2nd best car, best car in the world, Best Electric Car, best electric car in Britian, best electric car in Europe, best electric car in london, best electric car in the world, best value car, Britian, Car, E2O, E2O launch, E2O launched in UK, Electric car, G-Wiz, Leaf, London, Mahindra, Mahindra E2O, Mahindra Reva, Mahindra Reva-i, Nissan Leaf, Renault, Reva-i, Twizy, UK, value car, Zoe on April 27, 2016 by PlugInCaroo. Noise on Drought is prelude to Farmer Tax …Jaitley Baba Ki Jai! All the Noise and Media frenzy on Drought is prelude to Taxing the FARMER… the suicide sector of India… Jaitley Baba Ki Jai! Looks like the British Raj continues unabated EVEN after INDEPENDENCE of India!!! We already have the Tax on Salt even after the Salt Satyagraha, with the Tax on Agriculture sector the circle will be complete! While the Agriculture sector is reeling under one suicide after another… and the water table is falling… and the Government has washed its hands off crop damages of farmers (Farmers will have to insure their crops with insurance companies… one more expense… if they need to get crop damage… special Gift from Modi Sarkar) The government Tax Guys have got together and are planning to Tax the Agriculture sector. Another link: As Crorepati farmers mushroom, tax officials go digging. This entry was posted in Uncategorized and tagged Aam Aadmi Party, AAP, Agriculture Tax, Ancient India, Bikaner, Bill Gates, BJP, Congress, Corporate Social Responsibilty, CSR, Farmer Tax, Gajendra Singh, IMF, Jaisalmer, Jaitley, Jaitley baba, Jodhpur, Media, Mount Abu, Mt. Abu, Noise, rain water, Rainfall, States of India, Strom Water Drain, Sucide, Surface Water Drainage, SWD, Tax, Taxing the well, water harvesting, Water Harvesting Syste, WB, Well Tax, World BAnk on April 13, 2016 by PlugInCaroo. Quote Mahindra Reva Electric Vehicles Pvt. Ltd, the maker of E2O, a two-door small electric car, is set to get a boost from a clutch of start-ups that see untapped potential in the commercial application of electric vehicles in a country which is grappling to provide a sustainable urban transport solution to curb air pollution in over-congested cities. “We are working with a bunch of start-ups,” said Arvind Mathew, chief executive, Mahindra Reva in an interview last week. Mathew did not identify all the firms or the order expected from each. Unquote. Dreamz Mynewcar India Pvt. Ltd which runs online car sales portal mynewcar.in. Then there is another statement that goes on to say “Mahindra is set to launch the electric version of the Verito sedan later this month” dont know if the company forgot that they had fashionably “soft launched” the Verito in the FAME Eco-drive which was in line with what they promised on their “unofficial website” published in Dec 2014 at an expected price range of 9 Lakhs (US$ 13,700)!!! This entry was posted in Uncategorized on April 7, 2016 by PlugInCaroo. People’s Car – Electric Rickshaw! 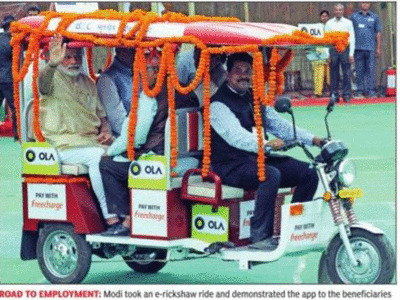 Electric Rickshaw has every quality to become the people’s car. A must have on Farms for many work like- ploughing fields, carrying harvest, pumping water using electricity, drilling holes using electricity and even moving earth, stones and sand! This entry was posted in Uncategorized and tagged app, book electric rickshaw, cheapest car, E-rickshaw, electric autorickshaw, Electric Rickshaw, entrepreneurship, Erickshaw, micro credit, micro-credit scheme, most economical vehicle, Narendra Modi, Ola, People's Car, Self Employment, stand up, Stand Up India, Start up, start up India on April 6, 2016 by PlugInCaroo. Strong sales of the Tata Nano in recent months will see the firm double its production output of the car. The move will see up to 20,000 Nanos built per month this fiscal year (April 2016 – March 2017). Sales in March of the micro car reached 8,707 units, closing in on the firm’s record high of 9,000 sales, which was set in July last year. For years the competing auto companies regularly pulled down the vehicle citing safety concerns. Tata Nano with is in fact as safe or unsafe as an Hyundai i10 which also doesn’t have Airbags. Tata Nano is also one thousand times more safer than bikes, scooters & motorcycles and It is also much safer than the 3 wheel auto-rickshaw too. But these are modes of transport of millions of Indians and billions worldwide. Many people do not understand that NCAP Safety Ruling has been used as a very cunning Trade Barriers to block the entry of Asian cars into US & European countries. NCAP keeps testing frontal crashes at 60kmph when in real life the crashes which happen due to overspeeding is ALWAYS above 100kmph. All subcompact cars (be it the Alto, i10, WagonR, Celerio, Beat, or from Volkswagen, Mercedes, BMW.. all) due to their short bonnet or “nose” are equally UNSAFE at this speed. People have started to realize that Tata NANO GenX Automatic is one awesome car!!! This entry was posted in Uncategorized and tagged Nano, Nano GenX, Nano GenX (AMT), Tata, Tata Nano, Tata Nano CNG, Tata Nano GenX, Tata Nano Twist, Tata Nano XT on April 4, 2016 by PlugInCaroo. Tesla take this _l_ and be happy… not even wasting time putting up a picture! Good cars like Mahindra E2O are blocked from entering both US and Europe to allow local expensive vehicles like Tesla and BMW to florish and keep EVs out of reach of the common man!!! Making something expensive and profiteering from it is similar to profiteering from organic fruits and vegetables by selling it ABOVE the price of commercial fruit and vegetable produce. Any vehicle that cannot BETTER the regular vehicles in BOTH price AND performance… is an inferior vehicle. This entry was posted in Uncategorized and tagged Elon Musk, Tesla Model 3, Tesla Motors on April 3, 2016 by PlugInCaroo. Zero Sales for Mahindra E2O in 2015-2016? Following is the stats shown on AutoPortal in which the Sales of Mahindra E2o is shown as Zero!!! Don’t know how accurate their numbers are… but it’s kind of shocking that there has not a single E2O sold in the year 2015… from March 2015 right up to Feb 2016??!!?? But when you combine it with the fact that Mahindra & Mahindra themselves do not have ANY numbers to show for E2O sales… you might be convinced that those are the real numbers out there. Mahindra has also refused to release any more variants of ANY model of Electric Vehicles as of date although it keeps promising to release a new variant within the next 6 months. This has been going on for almost 5 yrs now. All the reason that we at PlugInCaroo believe that the plug on Project E2O might be pulled around the year 2018! This entry was posted in Uncategorized on April 2, 2016 by PlugInCaroo.